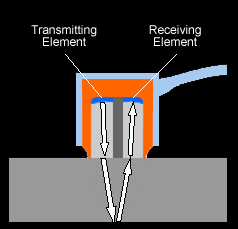 Twin element contact/compression transducers are specifically used for corrosion, pitting and thickness measurements in thin wall materials where a good near surface resolution is needed. The ability to focus twin element contact transducers makes them ideal for checking curved surfaces and lamination. These transducers can be manufactured to suit a curved surface. All of our contact transducers are supplied in a rugged stainless steel case as standard, with your own choice of termination. Other materials can be supplied on request.